A lot can hinge on properly preparing for small claims court. Whether someone owes you money or someone is alleging that you owe him, you'll have but one opportunity to present your argument to the judge. You'll want to be sure you understand the process so you can give it your best effort. When you -- or the party suing you -- file a small claims case with the court, the clerk assigns a date for a hearing. It should be stamped or written on your copy of the complaint that initiates the case. You can't hope to win if you don't show up. If you're the defendant -- someone sued you -- the judge will almost certainly award that party a default judgment against you if you fail to appear, giving him whatever he's asking for. If you're the plaintiff -- you filed the lawsuit against someone else -- the court will most likely throw your case out if you don't show up on the scheduled date. You can usually refile, starting over from scratch, but you would still have to pay the court costs associated with your first attempt. Contact the Clerk of Court to ask for a new date if you have a legitimate reason for not being able to appear. Courts are usually willing to reschedule within reason. Witnesses: Bring anyone who has specific knowledge that will support your claim in the case. This might include your office manager, accounts receivable manager or salespeople if you're suing over a debt owed to your business. If someone is suing you because you refused to pay for something because of shoddy workmanship, you might ask a professional to testify that the job was poorly performed. You can ask the Court to issue prospective witnesses subpoenas, requiring them to appear if they won't do so voluntarily. Documentation: Bring all documents with you that relate to your claim. If you've filed a small claims case against a customer who owes you money, provide the court with copies of the bills. Show documentation that the work was done or that the products were delivered. If a contract exists, bring a copy with the defendant's signature. If you have claims for damages, prove the value of the damage. For example, if a vendor ran a truck into your loading dock, provide a written estimate of the cost of repairs. If a contractor says you owe money for work he performed in your office, provide photos showing that the work was not done according to your requirements or according to the contract. 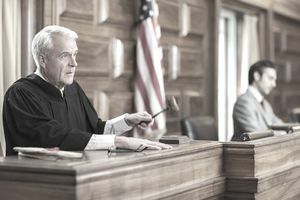 Whether you are the plaintiff or the defendant, showing documents that specifically prove your case and bringing in witnesses who can support your claim can mean the difference between winning or losing the lawsuit.